Image: Ilse Hayes, Paralympic athlete, standing alongside BeSpecular co-founder: Stephanie Cowper. We celebrated World Sight Day on 13 October 2016 at the National Council for Persons with Physical Disabilities in SA offices in Johannesburg. We were thrilled to have Ilse Hayes (7 time Paralympic medal winner) as our Guest of Honour. 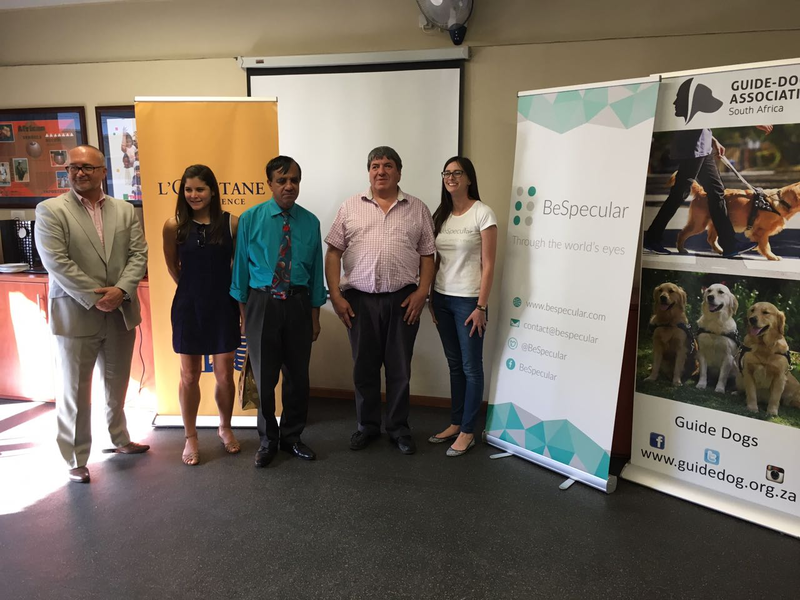 Other important guests included members from the South African National Council for the Blind, SA Guide-Dogs Association, L'OCCITANE en Provence, & EYESITE.co.za. It was a wonderful celebration of what organisations & individuals across South Africa have achieved. I encourage everyone to be present in your daily lives & to make the small moments memorable. Image: Ilse Hayes, Paralympic athlete, standing in front of the audience as she shares her journey. The second speaker was BeSpecular co-founder: Stephanie Cowper. Stephanie shared the progress that the BeSpecular team has made since its launch in July. The BeSpecular community has grown tremendously both in members and global reach. On World Sight Day, Stephanie was proud to announce the launch of BeSpecular’s next offering: BeSpecular for Business. BeSpecular for Business will enable employers to create a community within their companies that is inclusive of their visually impaired, blind and deafblind employees. Corporates offering their impaired employees the BeSpecular tool will not only helping their existing employees, but also make it more favourable for unemployed VIPs to enter the workforce through the on-site support structure. Image: Albert Peters telling us about the SA Note which has been developed by the SANCB and CSIR. Next up to take the floor was Assistive Technology Specialist from the SA National Council for the Blind: Albert Peters. The SANCB is an umbrella organisation that supports over 100 other organisations that work for and with the blind. A large focus of the SANCB is on the prevention of blindness where they perform cataract surgeries throughout the community, along with other sight-improving operations. The SANCB in partnership with the CSIR has embarked on developing a screen desk computer with speech functionality. The SA Note is a standard QWERTY keyboard with all the functionalities built into it. The SA Note is built mostly out of off-the-shelf parts meaning there would be no extra problems with maintenance and the software is opensource, but most exciting is the fact that the computer will have an ethnic language speech synthesizer. Languages such as Zulu and Xhosa can be processed on the SA Note, making it truly unique to the South African market! Image: Pieter van Niekerk standing in front of the audience telling us about the advancements made by SA Guide Dogs. Image: Jozef Rams from L'Occitane talking about their partnership with the SANCB. Last but not least, the CEO of L’Occitane en Provence South Africa, Jozef Rams, shared the story of the L’Occitane Foundation past, present, and future. L’Occitane’s success is its fight for the prevention of blindness is partly due to their employees’ total commitment to the cause and has since become ingrained in their culture. With its program UNION FOR VISION, the L’OCCITANE Foundation is focusing on prevention and treatments, in order to give access to quality eye care services at an international level. L’OCCITANE South Africa launched a local partnership in October 2015 with the SANCB. Together, the organisations have facilitated the several rounds of eye screenings and subsequent treatments. Since November 2015, L’OCCITANE South Africa has fundraised almost R110 000 and will continue acting locally to fight avoidable blindness. The video from the screening can be viewed here Jozef kindly handed Ilse Hayes a gift from L'Occitane en Provence to welcome her back home, and to congratulate her on her exceptional achievements at the Rio Paralympic Games. Image: Jozef Rams from L'Occitane presenting Ilse Hayes with a gift. The BeSpecular World Sight Day celebration was brought to a close with a thank you message by our co-founder and CEO, Stephanie Cowper. Stephanie urged all the organisations present to remember the year’s theme: Stronger Together, and to continue to work in unison rather than apart. At BeSpecular, our motto is: Share Your Vision. We would like to encourage more and more members of our community to Share Your Vision with others so that we can further educate the public and improve the lives of countless other visually impaired, blind and deafblind people in South Africa and abroad. Image: All 5 speakers standing together. From left to right: Jozef (L'Occitane), Ilse (Paralympian), Albert (SANCB), Pieter (Guide Dogs SA). Stephanie (BeSpecular).